John McCallum, born Campbelltown, Scotland, 1826 married Grace Queen, born Machrihamish, Scotland, in 1825. They married in 1851. He died Oct 31, 1907 aged 81 years. She died Jan 7 1911 aged 86 years. They had a son, John, born 1861. He married Charlotte Weekes, born 1883. They had two children, Mary Alemeda McCallum, and Hilda Gertrude McCallum. "At Port Elmsley, Feb 28, at the residence of the bride's father, by Rev N Campbell, John McCallum, Elmsley Twp to Charlotte Weekes, late teacher of Olver's Ferry Public School and second dau of Jas Weekes Esq." "Mrs. John McCullum. Following an illness of some months duration, the death occurred at her home, 24 McEwen avenue, on Friday of Mrs. John McCullum, widow of John McCullum and a lifelong resident of Smiths Falls district. 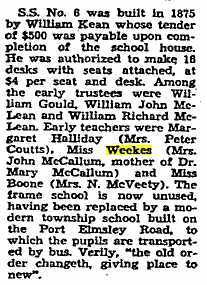 The late Mrs. McCullum was formerly Charlotte Weekes daughter of the late Mr. and Mrs James Weekes, pioneer resident of Port Elmsley. Born in Port Elmsley, she had resided in this section of the Ottawa Valley during her intire life and for more than 40 years she had resided in Smiths Falls or the immediate district. Piror to taking up residences here she taught school at Port Elmsley for some years. Mrs. McCullum was a devote Christian woman, and exentlified, by her life, to those with whom she came in contact; a true Christian character which was an influence for good among many. She was a member of the United Church and had been a member of Westminster Presbyterian Church congregation previous to the time of union. Actively instrested in church affairs, she had been a valued member of the W.M.S. and had been a teacher of Mary Ward Bible Class over a long period of years. Devoted to her home and her church, deceased had earned affection and esteem of a wide circle of friends and her passing will be sincerely mourned. Surviving are two daughters, Miss Mary, of the local Collegiate teaching staff, and Mrs. D.L. Boyd, of Toronto, two sisters, Mrs F.H. Cameron, and Mrs P.F. MacEwen of Cobalt, and one brother, Alex. Weekes, also of Cobalt. A simple but impressive funeral service was conducted by her minister Rev. A.D. Cornett, at the home on Monday afternoon when many friends and relitaves were present to pay final tribute. W.W.Cook and Dr. C.W. McBride acted as honorary pall-bearers with O.C.Abbott, W.A. Woodside, Dr. C.A. Curtis, Queen's University, W.D. Saunders, Harry Rickerd and M.W. Lever as active pall-bearers. Burial was at Hillcrest Cemetery, Rev. Cornett officiating also at the grave side. Numerous and beautiful floral al tributes testifide to the deep regret occasioned in her passing." McCallum, F.; 110 Brockville St.
McCallum, Miss Mary; 24 McEwen Ave.
McCallum, Mrs. J. S.; 110 Brockville St.